Mike: Hi all, we felt that we haven’t done a big game review for a while now so no filler game this week. 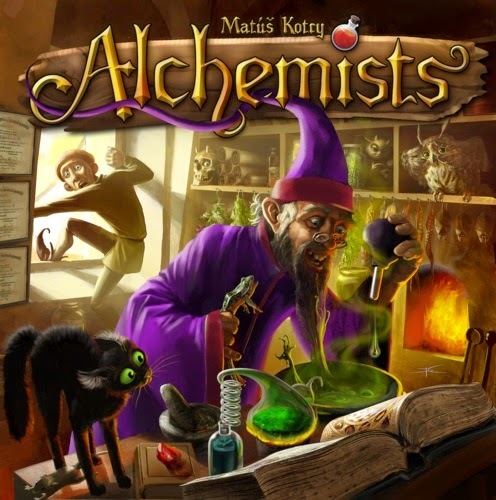 Our game for review is Alchemists by Czech Games Edition. Before we delve into the game let’s get something out of the way. This game requires the use of an app. Now I have read discussions about games that integrate with apps and how it has divided opinion in the board gaming community. I’m all for it as long as it’s done well and love to see where it might lead to over the next few years. Is the app for Alchemists just tacked on or a gimmick? No absolutely not the app does a great job of randomising the game. There is an option for playing this game without app support. To do this however would involve someone being games master and sitting at your game for 2 hours not being able to play. How boring would that be? I think I’d rather play monopoly. 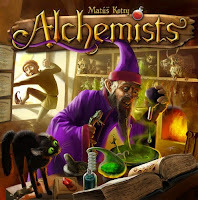 Alchemists is at its heart a game of two parts. 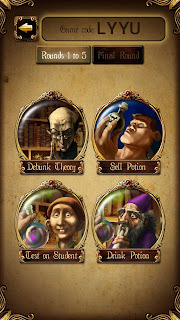 One side of the game you will be collecting ingredients to test and sell potions. You will also be trying to make a small engine to make money to buy useful artefacts. This side of the game involves some worker placement and a small amount of card management. The eight ingredients you will be working with. The other side of the game is a logic based puzzle where you are trying to work out the chemical makeup of the ingredients. This part of the game is key to get right and will be the main focus of your time. By mastering this side of the game you will be able to publish your theories and debunk others. David: Yes I like the way the app reveals what I have made when mixing ingredients. The app lets us use a phone each as well by putting in the game code at the top of the screen. This is good as we don’t have to pass the phone back and forth. I found this game a bit confusing at first as there was a lot to remember. But after a few goes I think I have cracked it. I sometimes forget to sell potions or buy artefacts. The artefacts can give you a lot of victory points at the end and can give you useful bonuses in the game. I do get worried sometimes that if I make a mistake it will ruin the game. Your checklist - don't make a mistake. Mike: You’re right this takes a few plays to get to grips and this logic puzzle element isn’t going to be for everyone. If you do make a mistake early on it will impact the rest of your game there is no getting away from that. You can still win by gaining points from artefacts and also exhibiting potions at the end round. It will be harder though if you have made some mistakes as in logic based puzzles one error can really spoil your party. We found playing your first game open and showing each other what we are doing with no secrets a great way of learning the game. The rulebook is a hefty 20 pages and a bit overwhelming. The first few pages do a great job of explaining the alchemy which can take a bit of time to get to grips with. Let me explain a bit further. You see each ingredient you use in the game will be have a chemical makeup like you can see below. Potions will be made from one big circle on one side and a little circle on the other. So in the example above the big positive red mixes with the little positive red to make a potion of health (positive red). So after this experiment you can cross off any negative red on your record sheet as it’s not possible for these elements to be present. David: I understood this after a few goes. It was helpful to play the demo game at the beginning of the hand book. I can now mark off the sheet correctly and know what to do if I make a neutral potion. I like the way you have to plan your turn and choose if you go first or last. You need to think carefully about what you want to do and do you have enough gold to pay for some of the actions. Mike: Oh yes a neutral potion happens when the ingredients are exact opposites. This can be very useful in the later part of the game as it will allow you to mark off quite a bit of information if you have worked out the logic to the puzzle. As you might have guessed by now there is quite a learning curve to be had here. I’ll go back to what I said earlier play a few games and help others out. David: I really like this game it makes you think and the best bit is when the answers are revealed at the end you can see how good you were at working it out. This is what makes it a great game to play though as each time I play I learn something more and get better at solving the puzzle. Mike: In my opinion this is not an entry level game. I believe it will play best with a group of gamers that are used to some worker placement games and want to step up the challenge. The main point here is there is so much going on. By the time you have understood how to effectively manage your turn the end game is approaching. Stick with it though it is highly rewarding. There is something about deduction based games that entice me in. For me it ticks all the boxes. The app as I have mentioned is a necessary addition there is no getting away from the fact that this wouldn’t work without it. Do we recommend it? Yes absolutely we have played this multiple times on the apprentice level of difficulty and will like to try out the master version of the game next. Judge your gaming group though it’s not as heavy as it may sound but the thought of spending 1-2 hours solving a puzzle will switch some gamers off. I personally love it and I’m excited to see app integration continue as long as it’s implanted as well as this.